Customer equity is the sum of all customer lifetime values for a firm. In other words, we calculate each customer’s lifetime value and we total all of these values together to determine customer equity. Customer equity, therefore, is the total expected profitability to be generated from a customer base over time.It is calculated using a compounding discount rate which allows us to consider the total expected profitability from our customer base in today’s dollars. Should we include future customers in a customer equity calculation? Existing customers are known to the organization – in that we know the current level of profit contribution, and we can estimate their retention/loyalty rate based upon our customer base history and analysis – which means that we can generally determine the customer lifetime value for each customer and then determine overall customer equity for the firm. When we include customer is likely to be acquired in the future, we may have less information about them, but we can also make certain assumptions about their likely customer lifetime value based upon our existing customer base – which means that we have relatively reliable information to include future customers. The reality is, that in today’s world of heavy social media usage, many businesses will gain new customers whether or not they engage in marketing-driven customer acquisition activities. This is because new customers will be attracted to the firm through referrals (both online and off-line), information they find online, then knowledge of the brand, independent research, and so on. This means that, even if a firm stopped all their customer acquisition marketing activities, that they would continue to acquire new customers. This is a strong case to always include future customers in the overall customer equity calculation, as the firm has earned these future customers due to their previous marketing activities and brand building efforts. What is the customer equity formula? Note: as customer lifetime value should always be calculated using a discount rate, the above sum will provide the total expected profitability from current and future customers on a discounted basis as well. Note that we e are calculating customer equity assuming that the firm is NOT continuing to deliberately acquire news customers. While this would not happen in practice, approaching the calculation in this manner is an effective way of measuring customer equity as it only takes into account marketing activities up until now. In this example, the retention rate is 60%, meaning that our churn rate is 40% – hence we lose 400 of 1,000 customers in the next year (year 1 of our calculation) and then 40% ongoing. However, this is slightly rectified due to our brand equity and we are likely to acquire 100 new customers each year, even without dedicated customer acquisition programs. For this calculation, as we have a fluctuating number of customers each year, we can use the average number of customers in the year. In year 1 we start with 1,000 customers, but end the year with only 700 = 850 average customer base for the year. Our 850 customers are then multiplied by the $2,000 pa per customer profit contribution, which equals $1,700,000 for the entire customer base. This figure is then discounted to 1,545,455 (to equate to a present day value). We start the next year with 700 customers only (1,000 – 400 lost + 100 acquired) and we repeat the process with the same assumptions (but note that the discount rate compounds each year). This is continued ongoing (I use a 50 year horizon – please see this article on the rationale). And the sum of all the discounted profit contributions (e.g. 1,545,455 +1,008,264 + 700,225…) equals our total customer equity of $7,357,407. Please note that this website has an Excel template for calculating customer equity (available for free download), which calculates customer equity in three different ways. Customer equity of the existing customer base only, with no future customers considered. Depending upon your measurement purpose, each customer equity calculation method has some merit and value. The first method is similar to measuring the overall value of a business as a going concern as it is likely that successful marketing activities will be continued. The second method measures the impact and success of all marketing efforts up to now in creating value and customer profitability for the firm. And the third method is more suitable for a small business (with limited brand equity) that is unlikely to acquire new customers without any marketing efforts. Important note: This formula is designed to measure the customer lifetime value of EXISTING customers only. You should also note that there is NO use of an acquisition cost, as existing customers have already been acquired and that expense is now historical (or a sunken cost). To make sense of what this formula is doing, let’s first look at the bottom line of 1+d-r, but remove the discount rate (d) and we are now left with 1-r.
We should know that 1 minus the retention rate is churn (or customer loss) rate. When we use the churn rate at the bottom (denominator) of the fraction/equation, we are actually calculating the lifetime period of a customer in years. Now let’s look at the impact of the retention rate at the top of the equation. At the top of this CLV formula (numerator) there is m times r. This has the immediate impact of reducing the margin (profit) to the likely margin be be achieved in the FOLLOWING year. This occurs because the formula is looking at an existing customer (already acquired) and estimating their FUTURE value – not their total value over the course of their customer relationship. To make sense of this difference, let’s compare a new customer’s CLV to an existing customer. The new customer is shown on the left hand side. As you can see, their acquisition cost was $500 in Year 0, their margin was $300 in Year 1, which then reduces by 60% each year in line with estimated retention rates. 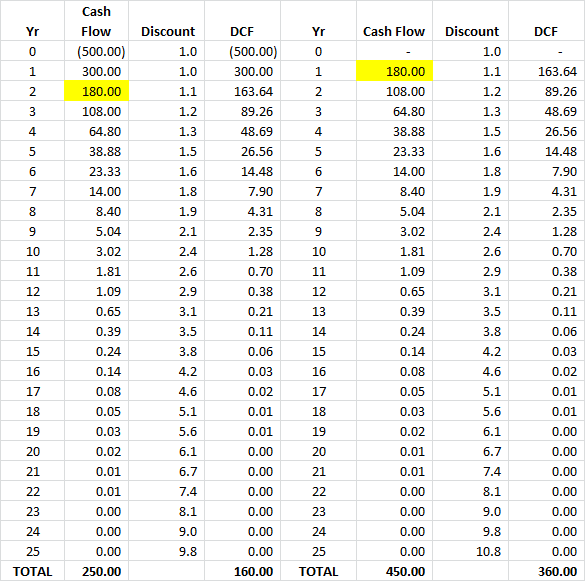 After the 10% discount rate, their CLV (shown as DCF = discounted cash flow) is $160. On the right hand side of the table, the CLV figures are shown for an existing customer using the above formula. 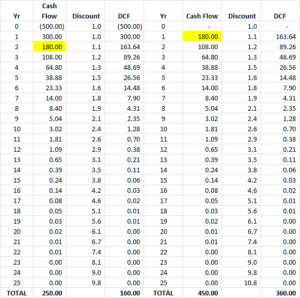 As you can see, there is NO acquisition cost (as they are already a customer), and we essentially start the customer in Year 2 with a annual margin of $180 (which is 60% of Year One’s $300 – note the two highlighted yellow cells). The main concern with this approach to calculating customer lifetime value is its use of static values. Firstly, it assumes a stable margin (annual customer profit), which is generally unlikely (please see article on increasing customer revenues). And secondly, it also assumes a stable loyalty rate over time, which again is generally unlikely. That’s why the free CLV Excel template available on this website allows for flexible revenues, costs and margins over time. So why use this CLV formula? 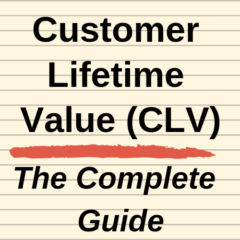 CLV = m.r/1+d-r is appropriate as a simple estimation of future customer value. It can be easily applied to a customer database (say in a spreadsheet format) where the customer’s profit/margin for the year is listed, along with an estimated loyalty/retention rate. This CLV value becomes a forward-looking metric that a marketer can use to determine the financial viability of various cross-selling and loyalty focused marketing tactics. Are you measuring the CLV of existing or new customers? Potential (new) customers (which will also include reacquiring lost or lapsed customers). There is a significant different in the CLV calculation for these two categories of customers. The most significant difference is in regards to the treatment of the acquisition cost. Obviously, existing customers have already been acquired – hence their acquisition cost is essentially a sunken cost that we would not take into account. Whereas new/potential customers still need to be acquired and will incur an acquisition cost. The second difference is that the loyalty (retention) rate of existing customers is likely to differ between existing and new customers. 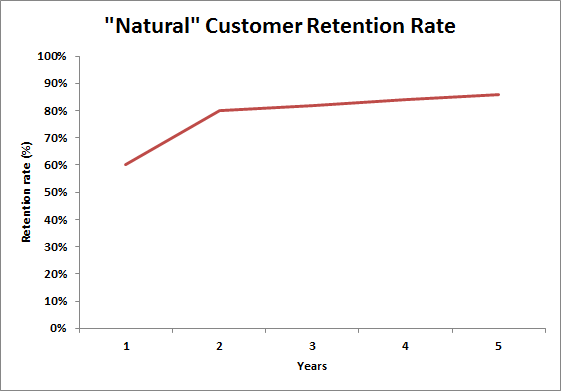 To make sense of this retention rate difference, let’s consider this graph of customer loyalty over time. 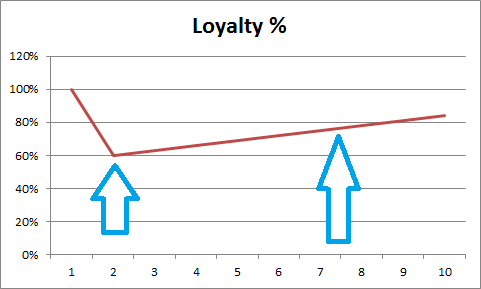 The first arrow on the left shows the loyalty rate for (new) customers after the first year of just 60%, whereas the arrow on the right shows the loyalty rate of existing customer (in years 7-8) approaching 80%. So why does this happen? When you think about it, the loyalty rate pattern makes logical sense. At the start (year 1), new customers are essentially trialing the brand’s/firm’s offering. If they are dissatisfied (or a consumer more prone to switching), then they are more likely to churn (switch or lapse) early in their brand relationship. However, if they are satisfied with their initial purchase and remain loyal after the first year, it is likely that the loyalty rate of the remaining customers will increase over time (as the less satisfied customers decide to discontinue or switch brands). What do these CLV results mean? 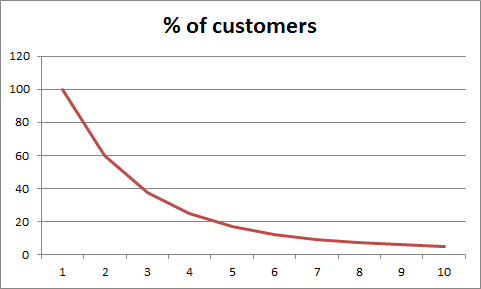 As you can see, the customer lifetime value for existing customers is 10 times the value for new customers. However, this is to be expected. 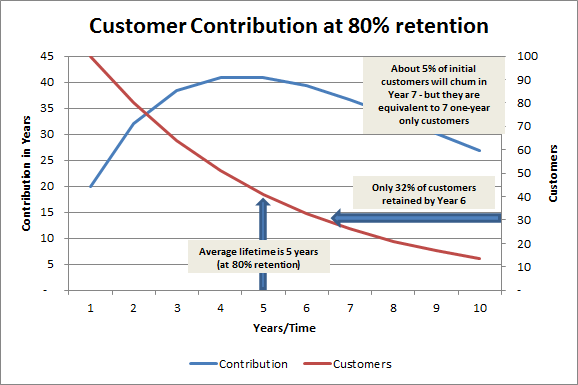 Due to the loyalty rate pattern for this example (60% increasing to 80%+ retention), there is only a small number of existing customers after ten years. Let’s now look at the percentage of customers that actually remain loyal for ten years (even with a retention rate of 60-80%). As you can see in the graph, only around 5% of customers are still with the firm/brand at the ten year mark. These customers are highly loyal (most probably due to choice, rather than habit at this stage) and therefore should be quite profitable ongoing. And compared to the less loyal newer customer, their CLV figure will be naturally higher. But keep in mind that within every cohort of new customers there will be very short-term low value customers, as well as a small number of long-term high value customers. Based on the differing CLV’s of new versus existing customers, there is possibly a suggestion that the best strategy would be to focus on existing customer only. But you are probably aware of the leaky bucket theory – which suggests that even with high retention rates there will always be a drain on customer numbers (as illustrated in the previous chart). Therefore, the clear strategy should be to continue with new customer acquisition, with the intent of identifying (or creating) the long-term, high value customer than underpins the ongoing profitability of the firm or brand.